The HTC Desire 600 dual sim runs Android 4.1.2 with Sense UI 5. It's a bit behind the curve with the more premium HTC One and One mini, which are rocking Android 4.2.2. 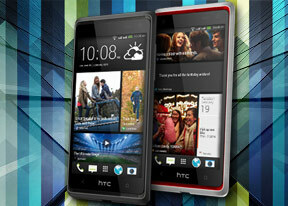 Still, HTC has treated its dual-simer with some of its attractive proprietary software features such as BlinkFeed. Unfortunately, Zoe has not made it and it's reserved for the bigger boys. Here's a quick showcase of the HTC Desire 600 dual sim software (and hardware) on video. You can long press on the homescreen or do a pinch zoom out gesture to enter the homescreen edit mode. Here you can add and remove homescreen panes, rearrange existing ones and set one of them as Home (the Home buttons brings you there). The only limitation is that you can't remove or rearrange the BlinkFeed, which is always the leftmost homescreen pane. Note that to access the settings in the app drawer and BlinkFeed you have to swipe down. The Desire 600 dual sim doesn't have a Menu button, but you can assign the long press action of the Home button to cover for it. If you do that, you'll give up its default purpose of opening Google Now - which will be a swipe up gesture instead. Unfortunately, the same goes for the widget lockscreen feature, which is present only on devices running Android 4.2.2 and up. As a result, on the Desire 600 dual sim you only get a traditional lockscreen with four non-customizable app shortcuts with the time and weather displaying above them. HTC has fiddled with the app switcher - it is now launched by double tapping the Home key. It shows a 3 x 3 grid of thumbnails of the recent apps. The upside is that you don't have to scroll like you do in the regular Android app switcher, the downside is that you can't scroll at all even if you wanted to - you only get to see the last 9 apps and no more (for some that's quite enough). You can swipe up to dismiss an app (which leaves an empty slot, an older app doesn't fill its place). The HTC Desire 600 dual sim also comes with a dedicated Car mode screen, which has been styled to look like the rest of the interface. There are only five big controls besides the clock and weather info. There's music info too, which takes a whole row by itself, along with shortcuts to Navigation, Dialer, the Music player (again) and Voice commands. The settings menu isn't dramatically changed in the latest Sense. It has the same design but the app icons and toggles have been redone. Other than that, all settings are where you'd expect them to be. Fiddling with the Settings menu. Wallpapers, lockscreen style, ringtones, notification sounds and alarms can be customized straight from here. On paper, the HTC Desire 600 dual sim boasts a quad-core CPU and 1GB of RAM, which isn't the highest amount ever put on a phone, but it is still respectable. Still, even with Sense on top, the phone ran its Android 4.1.2 operating system buttery smooth. The lower screen resolution sure helped here, but we also think that HTC has spent some time streamlining Sense UI for running properly on the limited graphics processing capabilities of the Snapdragon 200 chipset.